Nizlopi announce last tour dates for 2 years!!!!!! Free before 9pm, £4 therafter. Channelling the humour and harmonies of Queen, the attitude and funk of James Brown and the sonic vocal stylings of the Chili Peppers and Zeppelin, Sketchbeat are more than boys with guitars. Gig goers have had enough of whining self interest – it’s time to get hot and angry on the dance floor! Yes King, the acclaimed hip hop, dancehall and ska outfit have been revealed as the special guests to headline at Funkdub’s fourth birthday event at Telford’s Warehouse in Chester on Saturday, 8th November. Funkdub have been showcasing eclectic DJ nights and some of the UK’s most respected artists throughout the last four years. The birthday event promises to outshine the legendary Telford’s Warehouse performances from Pama International, Max Sedgely & The Shoots, Little Barrie and Keb Darge. Yes King is the latest offering from Mark Rae, one half of the celebrated Rae & Christian, architect of the sadly now defunct Grand Central Records, and owner of Manchester’s famous Fat City record shop. The live show, just returning from tours of the US, Australia and New Zealand, includes UK hip-hop icon Mystro, Yes King co-creator Rhys Adams and an outstanding brass section. Funkdub founder Sam Hutchinson is thrilled to have secured a band of Yes King’s calibre in Chester: “Running Funkdub over the last four years has been a brilliant journey. Between Funkdub and its various spin-off nights, we’ve had over 65 DJ outings, playing some of the finest and rarest funk, dub, electro, hip-hop, soul and rock & roll in venues such as Alexander’s, City Bar, The Student Unions, The Frog and Nightingale, Off The Wall and of course our spiritual home Telford’s Warehouse. The band will be supported by Funkdub DJs 3DJ and G-Kush’s unparalleled mix of eclectic vinyl before and after the main event. Funkdub Live Presents Yes King will be on Saturday, 8th November at Telford’s Warehouse. Free Entry Before 10pm, £4thereafter. 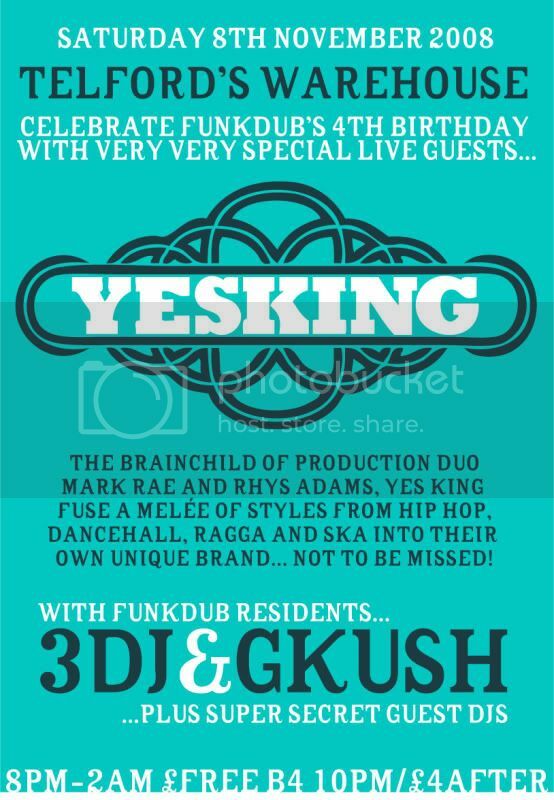 « Funkdub’s 4th Birthday with YES KING! Since signing his record deal, Aynsley has sold over 75,000 albums. He has played alongside blues legends such as Buddy Guy, John Mayall, and Robert Cray aswell as big name pop artists such as Bryan Adams and Fun Lovin’ Criminals. His recorded work has seen him working with Producers Jim Gaines (Santana, SRV) and Greg Haver (Manic Street Preachers, Catatonia) on both sides of the Atlantic. Hailing from the city of Manchester via Bolton, The Furs are a new 4 piece band playing in whatever venues we can to make a name for ourselves. with influences including Ocean Colour Scene, Stereophonics and trains to and from Bolton, they play music to anyone who’ll tap their feet, clap their hands or even full on rave if it takes their fancy. Open mic at Telford’s in Chester. On the 30th November the hosts are the wonderful Elise and magical Kai bringing you a combination of their own melodies with some familiar tunage included in for good measure! Bring your instrument along, whatever it may be and come join in musical creativity, always love to see new faces as well as old favourites. Get in early to make sure you get a slot.